Fall Fiesta Sugar Maple is a dense deciduous tree. It is a reliable shade tree with a medium to vigorous growth rate once established. Fall Fiesta features a fiery blend of fall colors ranging from yellow to orange and red. This particular tree is one of the hardier selections and is adaptable to most soils with the exception of compacted, poorly drained soils. Under ideal conditions, Fall Fiesta Sugar Maple can be expected to live to a ripe old age of 100 years or more. Think of this as a heritage tree for future generations! As the tree ages, the bark becomes deeply furrowed and grey. The bark rarely develops frost cracks or fissures. 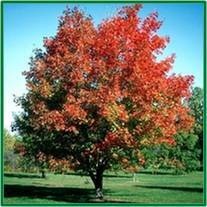 Fall Fiesta Sugar Maple is rarely troubled by insects or diseases, making it an excellent selection for the homeowner looking for a low maintenance, easy to care for tree that offers a beautiful kaleidoscope of colors in the fall.